Be the first to share your favorite memory, photo or story of Jondeen . This memorial page is dedicated for family, friends and future generations to celebrate the life of their loved one. Age 79 of Owosso passed away Wednesday April 3, 2019 at PleasantView. A Mass of Christian Burial will be held 10am Monday April 8, 2019 at St. Paul Catholic Church with Father Dieudonne Ntakarutimana officiating. Burial will follow at Oak Hill Cemetery. The family will receive friends at Nelson-House Funeral Home on Sunday April 7 from 3pm to 6pm with a rosary being prayed at 5pm. Jondeen was born June 23, 1939 in Owosso, Michigan; the daughter of John Tubbs and Phyllis (Mills) Tubbs Luchenbill and the step daughter of Donald Luchenbill. 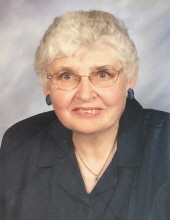 She was a member of St. Paul Catholic Church and ARC of Shiawassee County. Jondeen will long be remembered for her devotion to family, her ability to remember names and dates and recall long passed events with an uncanny attention to detail often long forgotten by others and her love of celebrating her birthday. She is survived by many cousins and her dear friend Jane Durgan. Jane and Jondeen could frequently be seen walking around Owosso seeking out a good ice cream cone or donut. Jondeen was loved by those who knew her and returned that love in countless little ways-a smile, a gift of one of her many craft projects and her ability to express a heartfelt thank you. She was preceded in death by her father, mother and stepfather. Memorial contributions are suggested to St. Paul Catholic Church. Jondeen's cousins wish to thank the staff of Shiawassee Medical Care Facility for all of their love and kindness shown to Jondeen. To send flowers or a remembrance gift to the family of Jondeen J. Tubbs, please visit our Tribute Store. "Email Address" would like to share the life celebration of Jondeen J. Tubbs. Click on the "link" to go to share a favorite memory or leave a condolence message for the family.